As Aban Hawkins, you discover the lost and forgotten treasures of Ukampa in South America while searching for your estranged father, world-famous archaeologist Jim Hawkins. Before he disappeared, he left his daughter Tina with a map leading to the ruins of this treasure. The game will take you to the “frozen tundra of the antarctic, undiscovered temple ruins, and the vast caverns of South America” while searching for your father. There are are over 100 stages and the game features multiple endings. The game also supports single and simultaneous 2-4 player co-op and versus multiplayer. I was wondering where this game was for the longest time. I first played it last year at PAX Prime and it was FANTASTIC fun with 4 people, and slightly irritating . Definitely going to pick this up. 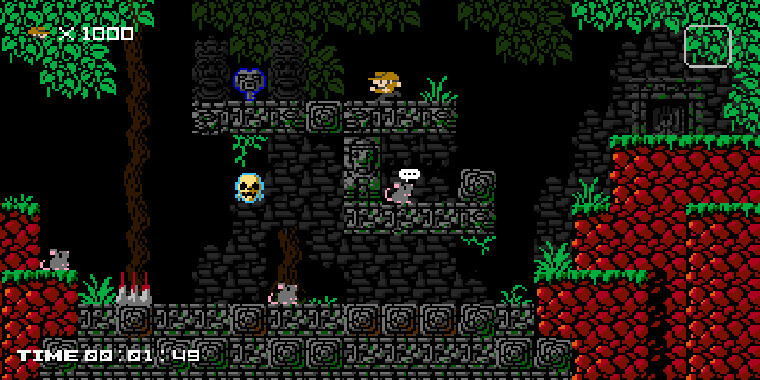 It's basically a 2-d platformer that is out to kill you. It gives you a ton of lives to get at least 1 person through an area, but if everyone dies you start that segment over.